Tip of the Day: 9 more days until Halloween! If you're thinking of participating in National Novel Writing Month, you may be rushing to get ready over the next few days. 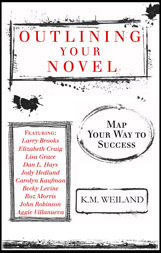 I found a wonderful resource on outlining recently: the book Outlining Your Novel: Map Your Way to Success by K. M. Weiland. The price was right on the Nook and the advice has been great. For example, I drew a map of my storyworld after I wrote the first two chapters. I can already see how I need to revise my chapters due to the map, adding in railroad tracks and street names, explaining how far characters live from each other, etc. Other ideas? Write down everything you think you know about this story. At the least, if you have to leave the story for a while, you'll be glad you wrote down what you were obsessing about during the creative process. If you jump into Nanowrimo, good luck and have a great time! As much as I would love to do NaNo, it won't happen this year -- must use November to finish revision of SR!